now that i know how to knit!!!!!!! It's Thursday nite and the nite that so many have been waiting for is finally here ... College Football! Fans are gathered around TVs everywhere to begin that ritual that they've been counting the days for .... declaring allegiance to their team, buying everything imaginable in their favorite colors to show their undying commitment and loyalty ... and for the next few months weekends will now be scheduled around kickoffs ... cookouts and tailgates will become MUCH more significant .. and in order to support this mindset i'm planning for the Fall as well by getting my knitting projects lined up according to the game ..... i have found that knitting affords me a perfect seat to sit back and watch this all unfold ... one quarter at a time, one game at a time .... and in the ideal world, my husband's team will play for the National Championship ... which, for a knitter, translates to a LOT of knitting!!!! Ready for a fun "recipe" to take to the games? Begin by raiding your stash and pulling the colors that make you smile (perhaps if you pull Team Colors you'll just blend right in while knitting!) ... Textures are HIGHLY encouraged because they add such Character to your finished project. 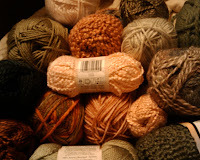 Grab some 11s or 13s circular (in order to accomodate the large number of stitches) and get ready to knit. If space isn't a big deal, just knit directly from each skein. However, for my swap i'm going to pull 8 yards from each skein and tie them loosely together so i can wrap it into one GyNormous Magic Ball! Leaving a 6" tail for fringe, start with a slip knot and cast on 100 stitches in your 1st color. 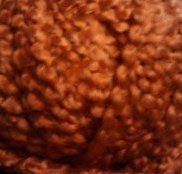 Cut your yarn, leaving 6" at this end also so your fringe will match. You are through with your 1st row so set this aside and grab another color. When you're happy with what you see i would recommend binding off in the same color as your last row of knitting. (I do have some friends that find that it necessary to 'plan' their magic scarf, or they might not be able to breathe! I also have some kindred-spirit friends who can just grab-n-go! Perhaps this scarf is a bit of a personality test as well! ) Use an overcast knot to tie the fringe a bit more securely and trim if you have to ... or leave dangling if you find that look works for you! With this disappearing act you may find that if you can clean out your stash, you'll NEED to make a yarn shop run before the NEXT game!!!!! Once again ... it's all about Keeping Knit Simple! what does a prayer shawl look like?